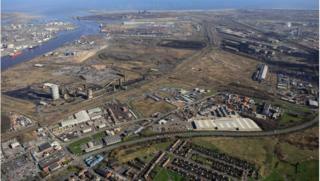 Up to 20,000 jobs could be created under 25-year plans for the area around the former SSI steel plant in Redcar. Almost 170 years of steel making ended on Teesside in October 2015 when the firm collapsed, with the loss of more than 4,000 jobs. Now, those behind the South Tees Development Corporation (STDC) draft proposal hope it will result in the region becoming a "national asset". STDC admits however, there is "limited funding" in place from the government. The site will include test tracks for self-driving cars and a nature area. Conservative Tees Valley Mayor Ben Houchen, who chairs STDC, said: "There are real prospects for post-Brexit growth through international trade for many decades. "This is a 25-year vision and one that will be pivotal in transforming the South Tees area, and wider Tees Valley, into a national asset." The masterplan covers 1,800 hectares (4,500 acres) and incorporates businesses including PD Ports, British Steel and Northumbrian Water. The corporation accepts it will need to submit a business case for the rest of the money. Mr Houchen did not say how much would be needed, but said he was "hopeful" the government would announce "a kick-start of funds" in next month's Budget. He added some companies were looking at "multibillion-pound investments" and said more than 70 businesses had come forward as they were "attracted by the location, the deep port, geography and the skills set". The land is owned by SSI, Tata Steel, Redcar Bulk Terminal and British Steel, and the plan states it would be "critical" for STDC to either own it directly or secure partnership arrangements. The corporation has the power to use Compulsory Purchase Orders, if required. The clean-up of the site "may not need to be as significant as perhaps perceived", but the plans still show it will take until 2024 before the site is assessed and buildings demolished, with the first business zone completed by 2026. When the project is completed planners claim that by 2042, it will pump an additional £1bn into the local economy annually. Bosses also say they will investigate whether the site could become a Special Economic Zone after the UK leaves the EU. These allow tariffs and customs duties to be set locally in a bid to boost foreign investment. STDC also warns adjacent marshes will need to be saved as there are protected species such as bats, otters and water voles. Under the plans, STDC said improvements will be needed for site access from the A66, and a revamp of the existing South Bank and Redcar British Steel railway stations, alongside more regular train services. The corporation did look at other options including creating a housing estate, or a leisure facility or even doing nothing and walking away, but the business park came out as the best option, the document says. A consultation on the plans runs until next month.